Versatile H-D® Detachables™ Passenger Backrest features a rich gloss black finish that complements almost any paint colour. Equip the contoured rack with a duffle bag for a cross-country solo ride, or attach the available Detachable Passenger Pillion P/N 52689-09 for a comfortable two-up tour. 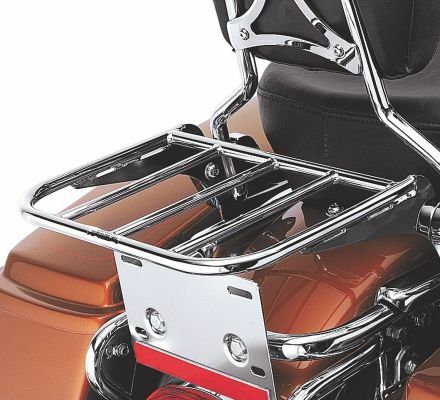 Fits '94-'08 Touring models equipped with H-D® Detachables™ Sissy Bar Upright P/Ns 52805-97B, 52933-97B and 52723-06. (Does not fit P/N 52935-04.) FLHRC and '07-'08 FLHRSE models also require separate purchase of Saddlebag Hinge Stop Kit P/N 90580-09.